Many women begin to put on a few extra pounds as they go through menopause, and for most women this is an unwanted weight gain. In some cases, it may even be a health concern. 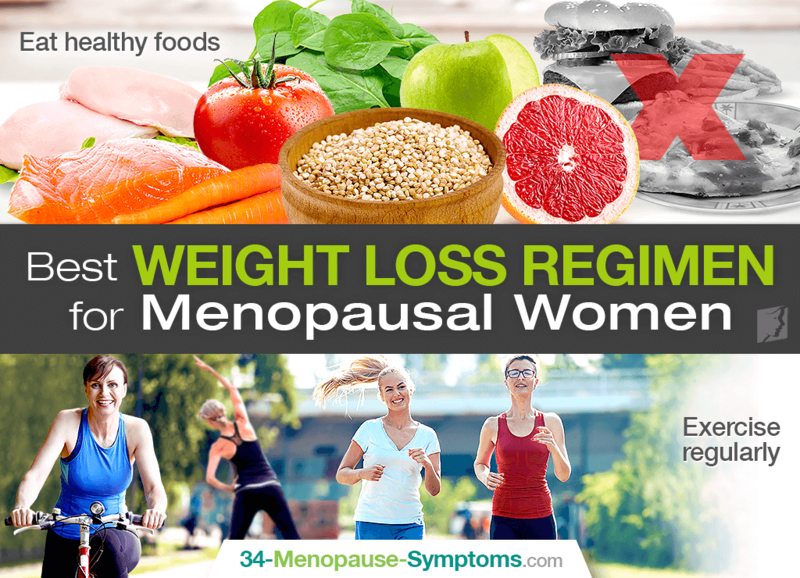 However, there are a number of ways to keep weight off during menopause, so read on to learn about the best weight loss regimen for menopausal women. The link between menopause and weight gain is hormonal imbalance. During menopause, a number of hormones, notably estrogen, begin to be produced less in the body and cause hormone levels to fall out of balance. Because the body is receiving less estrogen from its normal source - the ovaries - it tries to receive estrogen from other sources. Fat cells happen to be another source of estrogen, and so the body produces more fat cells than normal, leading to weight gain for menopausal women. One of the most important parts of the best weight loss regimen for anybody is eating healthily. This is especially important for menopausal women, whose bodies are readier than most to manufacture extra fat cells. Eating healthy involves both incorporating good foods and avoiding bad foods in your diet. Good foods to incorporate are fruits, vegetables, whole grains, and lean proteins. Low-fat or no-fat dairy is also an excellent choice for a healthy diet. These foods not only provide all the nutrients that our bodies need, they are also excellent sources of things like fiber, which can help you feel more full while consuming fewer calories, an essential piece of losing weight. You should also avoid certain foods. Anything that contains saturated fats, trans- fats, high levels of salt, cholesterol, or added sugars should be at least limited if not avoided completely. These are food ingredients that make your body more likely to form new fat cells and makes it harder to lose weight. Often, prepackaged foods are likely to have higher levels of these ingredients. Additionally, keep in mind that many popular beverages have high levels of sugar and can contribute to weight gain. The other main component of weight loss is exercise. Experts recommend 150 minutes, or two and a half hours, of exercise each week in order to keep your body healthy. Some of the best exercises are those that are called vigorous activity, meaning they keep your heart rate high and your breathing fast. These exercises, such as running, swimming, and biking, help burn the most fast and build the most muscle. However, exercise can be difficult for menopausal women; however, as menopause is also a time when osteoporosis is most likely to emerge. Menopausal women should be sure to consult with their doctors to formulate a low-impact strategy of exercise if bone loss is becoming a problem. Luckily, exercise can help manage the symptoms of osteoporosis, so a good regimen can help you lose weight and strengthen your bones. The best weight loss regimen for menopausal women combines a healthy diet with smart, ability-appropriate exercises in order to provide the best results. To learn more about losing weight during menopause, read about the best ways to lose belly fat.